Anna Nistratova (*1975 in Moscow) is an independent curator, researcher and artist. Between 1988 and 2010 she worked for several publications such as “Ogonyok“, “Rolling Stone” and contemporary art magazine “Black Square”. Since 2003 she has been working with documental, social and art photography. Nistratova is a co-founder of Agency.Photographer.Ru (2004-2006). In 2009-2010, she worked in Sochi as a producer and interpreter for international journalists, among others for the multimedia research project “The Sochi Project” conducted by Dutch photographer Rob Hornstra and Dutch journalist Arnold van Bruggen. In 2010, she started working at the FLACON design factory in Moscow on the exhibition “Sight Unseen. International Photography by Blind Artists”. Between 2011 and 2013, she curated cultural and social projects of the FLACON design factory. In 2014, she curated the exhibition “Casus Pacis” at the Street Art Museum in St. Petersburg. Since 2015 she has been a director of the “Tolk” Gallery (Nizhny Novgorod) promoting street artists of the city. She specialises in street art, research and sociocultural projects. Besides that she paints, produces street art, practices photography and is working as a cultural journalist and lecturer. The artist in modern Russia is powerless – powerless both in creating a social or political message and in the degrees of influence this message can reach within society. 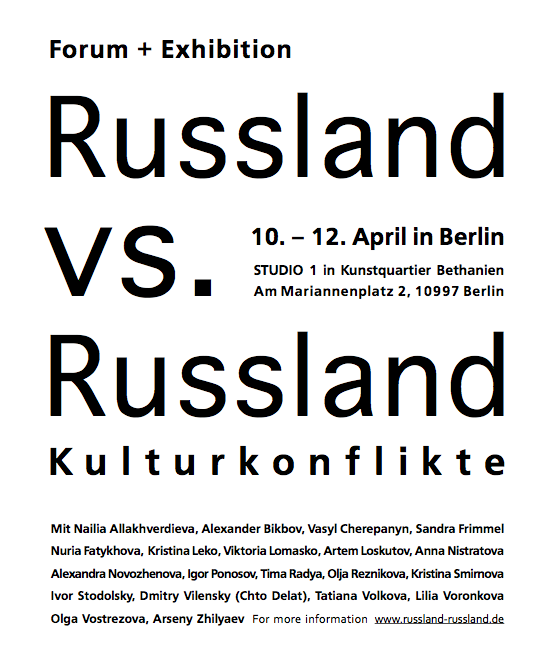 Our art community is an exact reflection of the current state of Russian society in general. There is no unity there; it is split into groups and individuals each holding their own point of view and despising their opponents. The number of artists working on political or social topics is exacerbatingly low; the majority of them hold left-field views and are marginalised. Such artists work for themselves or for small groups of like-minded supporters without expressing any wish to work with a broader audience and unprepared public, although suggesting that their ideas are aimed at improving society and the political situation. Speaking about anonymous street statements and even of signed ones, it must be mentioned that the number of politically or socially related pieces or textual messages is negligibly low. It might be a sign of apathy as a result of the current events, a sign of passivity and failure. It is also possible to see it as the lack of efficient criticism or protest as an art statement, or to read it as a hint to the art community to use other forms of social and political activity beyond artistic gestures.